Stitch resist, one type of shibori dyeing, is fun because you can better control where the white lines are. However, it's more work than the usual tying and dying. Generally I stitch with dental floss, pull it tight, wrap the extra floss around the gathers, and then put a couple of rubber bands over that for a good white line. It's certainly possible to do hearts and other symmetric shapes without stitching, but I find that I get a much cleaner, crisper, and more uniform heart with stitching. And it's just one quick line of stitching, so I find that it's worth the small amount of extra work. Letters can be a lot more complicated than hearts, so stitching works well for them. Here are pillows I made with letters on them. After I stitched the outline of the K and pulled the stitching tight, I just banded up the rest of the pillow case like a bullseye pattern. Below you see the back of the K pillow (the distorted bullseye) and a side view of the pillowcase that shows how I applied bands of colors. This M worked particularly well. When I was feeling really ambitious, I did entire words on 12" throw pillows! These three took quite a while. The worst part was removing the stitching and rubber bands when I wanted to wash them out. You can get really creative with stitch resist. 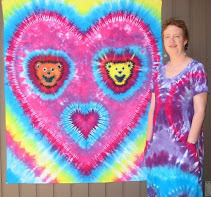 In this rainbow heart and bears tapestry, the bear faces are stitched, as is the inner heart and the inner line of the outer heart. I didn't want to take chances that my folding or tying might slip--stitching makes it much more secure. A friend brought back this blue floral stitch resist tapestry back from China. It's about 4 feet by 4 feet and all stitch resist, probably vat dyed. Here is a view of the right side of a corner with the wrong side of a different corner. The pattern differs based on which side the stitching is on! I dyed this shirt after seeing the tapestry. It's hard to get the very fine detail of the tapestry onto t-shirt fabric, but it's still one of my favorite shirts. The vine pattern goes around the back of the neck. For the stem, I folded along the line and did a running stitch through both layers of fabric, which gives it that double-line appearance. The more faded leaves are where I didn't manage to pull and tie my stitching tight enough.